I have several summer sewing projects that I want to have on record, so I'll be playing catchup for a bit. 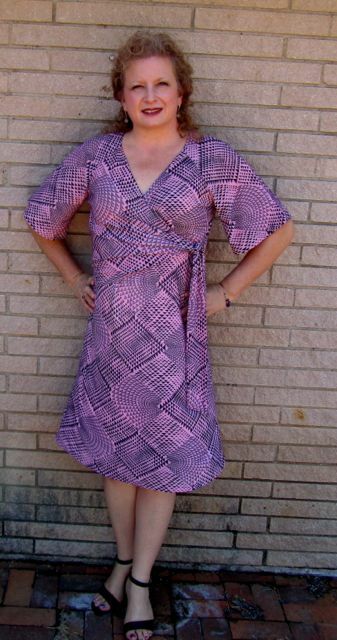 This dress is Simplicity 2369, which is a mock wrap dress or top with raglan sleeves. The pattern also includes some pants, which I have not yet tried. Many people on the internet have made this dress, and it generally looks very flattering on them, so I thought I would give it a try. The fabric I used was some pink and black slinky, thin knit from Joann Fabrics. I debated which sleeve version to use, but I decided on the kimono sleeves just as an experiment. I cut a size 16, which fits about right on this pattern. I did use some new techniques. Rather than turning the neckline under and stitching it down, the pattern had you line the neckline with a facing, made out of the same fabric, that is stretched to fit as you sew. I did not do the greatest job, but from the outside it looks fine. Also, I found some good tips at The Slapdash Sewist on how to sew the ties so that no seams show. In addition she had a great tip in there about sewing a few gathering stitches on the front (hidden underneath the wrap portion), which keeps some of the fullness in the front to mask your tummy. From this angle I see that I've got it pulled too tight and ought to loosen the knot on the tie a little bit. I don't think this dress is as attractive on me as the tank dresses were. Since I've made this, I read somewhere on InsideOutStyleBlog that "H Shapes" (which is me, one big rectangle) should avoid wrap dresses. Her other style advice seems to be right on as far as my shape is concerned, so this may not be a great pattern choice for me. However, the dress is still WEARABLE (which is my main goal at the moment when sewing clothing), and if I find a fabric that I like I may try it one more time, only using the shorter sleeves. If you are thinking about sewing a particular pattern, look online to see who else might have made it and what their experience was. Then, just try. The worst thing that can happen is you won't like it, but even then you will have learned something and added more sewing experience to your repertoire. Angela, this dress looks great from my perspective! You are a talented seamstress, and I believe that you have an eye for choosing the right fabric for a project. That is one of my challenges with making clothes (which I have very rarely done)...selecting fabric that is right for the garment. Thаnks for ones maгѵelous pοsting!